With work on Deus Ex: Human Revolution winding down and work on Thief 4 kicking into full swing, Eidos Montreal's floor space is making a major transition. Many large videogame studios have multiple projects going on at any given moment, but - as with any office - space is usually a premium. Naturally, you want all your designers and producers in one spot to make communication easier, and they need to be able to zip on over to the artists and programmers when they need something. According to Deus Ex: Human Revolution art director Jonathan Jacques-Belletete, the Thief 4 team has usurped the Deus Ex team's primary floor space at Eidos Montreal. "We've ramped down, and they've ramped up," Jacques-Belletete told Eurogamer. "The main production floor is occupied by them now. We're occupying a lesser space." The transition felt a bit odd, said the Deus Ex director. "For the past four years all the directors on Deus Ex were sitting in the same area, with tons of concept art and design papers all pinned up on the walls ... the day we went to take them down all the directors of Thief were sitting in our places. It was a weird day." Of course they were sitting there, Jonathan. They're making a thievery game - they're bound to be sneaky. While Jacques-Belletete was adamant that he couldn't reveal any details about the game - and that the Thief 4 team was entirely separate from the Deus Ex crew - he promised that the franchise was "in really good hands ... It's a really kickass team [on Thief 4]," he assured gamers, "some great people." "I cannot say anything about the game apart from that it'll rock your shorts." Eidos Montreal had previously confirmed Thief 4's existence, but the game still has yet to be formally revealed. 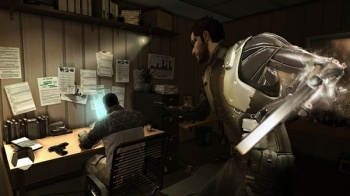 Deus Ex: Human Revolution is out this August.